After the success of The Refuge and 8 Women, François Ozon is back in the UK with his latest film“Potiche" (Trophy Wife), inspired by Pierre Barillet and Jean-Pierre Grédy's play written in 1980. 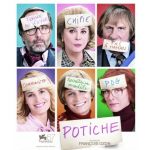 The film is an accurate depiction of the 1970's, and relies on the charisma of an impressive cast : Catherine Deneuve, Gérard Depardieu, Fabrice Luchini and Karine Viard. Franceinlondon was lucky enough to meet the French director. The most captivating and eccentric history class you have ever attended! Truth be told, François Ozon's Potiche is more efficient than any history class you have ever attended about the 1970's in France. With impeccable attention to historical details, the French director shows a great insight into these years. The film also underlines the feminist struggles of the 1970s. Initially, Suzanne Pujol(Deneuve)is a potiche, a pejorative French word which can roughly be translated as “trophy wife.” However,as François Ozon told us 'throughout the film, she breaks free and undergoes a series of transformations to become a modern and ambitious woman, far from her image of devoted and submissive wife'. He then added : 'Through the character of Suzanne Pujol, all women find a proper place in society, turning the patriarchal order on its head'. It seems Ozon also had a lot of fun recreating the period. The film's soundtrack is deeply rooted in the 1970's adding a touch of nostalgia for anybody missing the glory days of disco. François Ozon declared :'I asked Philippe Rombi to take inspiration from the 1970's comedies and the scores of Vladimir Cosma and Michel Magne, especially to illustrate the love story between Suzanne and Babin'. It is absolutely delightful to hear some of the 1970's hits like Michèle Torr's "Emmène-moi danser ce soir", Il Etait Une Fois's "Viens faire un tour sous la pluie", and Jean Ferrat's "Que c'est beau la vie"(which was written in the 1960's), performed at the end of the film by Catherine Deneuve. What is really new in this film is the immersion into a politically tormented time. François Ozon explained :'The 1970's crises put an end to Les Trente Glorieuses, three consecutive decades of economic prosperity combined with high wages that lead to mass consumption'. As a consequence, there were a lot of strikes and some bosses were detained by workers, supported by the powerful Communist Party which was one of the leading political forces in the country. The film then perfectly highlights the social and political gap between these two separate words: entrepreneurs and workers. In addition, some subtle innuendos echo the contemporary French political soap opera. For example when Robert Pujol urges workers to 'work harder to earn more', as Nicolas Sarkozy said during the 2007 Presidential campaign. 'I simply couldn't help but draw this parallel between these two decades which are really quite similar', François Ozon told us. Since their very first collaboration in François Truffaut's The Last Metro, Catherine Deneuve and Gérard Depardieu have appeared together in seven films. These legends of French cinema combine their talents in this film and set a tone of moving sincerity. Although she is sometimes wearing a retro tracksuit and hair curlers, Catherine Deneuve remains impossibly glamorous, contrasting with Gérard Depardieu's endearing roughness. Their brilliant performance is matched by the rest of the cast, which includes Fabrice Luchini, Karin Viard as Robert Pujol's receptionist and mistress, and the Pujol's children Judith Godrèche and Jérémie Renier. Verdict : Potiche is a hugely enjoyable film, in the vein of François Ozon's earlier masterpieces 8 Women and The Refuge. But this one must be particularly awarded for combining irony and emotion, as well as the comedy's delights and a social and historical accuracy. A must-see, definitely. Je trouve votre site hyper génial, je vous souhaite plein de succès car vous le méritez. I hope i am the lucky one!! What a great opportunity to meet a classic star, the epitome of French chic. Hope I'm lucky!